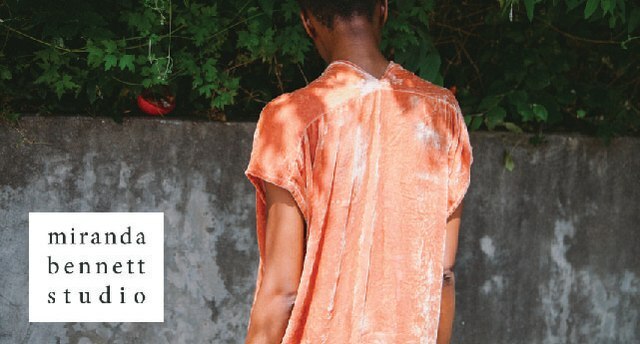 Miranda Bennett Studio is a collection of modern, plant-dyed apparel made by women in the USA. We dye our textiles in-house with natural pigment and cut, process and ship our apparel from our Austin, Texas based studio. Our locally-based manufacturing partners are paid living wages and are made up of both recent and long term refugees to the Austin area. Miranda Bennett design ethos is based on thoughtful simplicity. Dyed primarily with plant-derived materials, including extracts of various wood varieties, pomegranate rind and natural indigo, we are now laying the groundwork for agricultural partnerships that will lead to seasonal hues for our collection representative of the ecology of the Texas Hill Country. ​ Each collection is designed to mix and match seamlessly with our previously released styles and limited edition colorways, creating the building blocks for a well-rounded wardrobe. For wholesale inquiries, email Miranda Bennett Studio.